This one is for those of you that don't understand what Agave Nectar is. For those of you wanting to cut some calories, but don't want to lose your sweet tooth... here is how to do it. In one Tablespoon Sugar there is 75 calories. Each Tablespoon of Agave contains 60 calories. 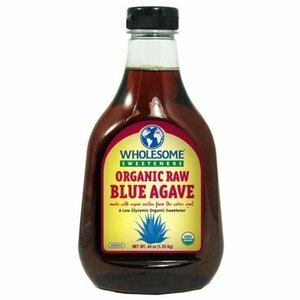 However Agave Nectar is sweeter so you use less Agave than you do Sugar. Therefore if you cook with Agave you drop the calorie count by a large amount. For each cup of white sugar replaced, use 2/3 of a cup of agave and reduce other liquids by 1/4 cup. Because the moisture content of Brown Sugar is higher than that of white sugar, liquids may not have to be reduced as much when substituting agave nectar. Agave syrup may cause baked items to brown more quickly, so reduce oven temperatures by 25°F is and increase baking time slightly.